What are Amazon Product Listings? An Amazon product listing is the product page for each of the items you sell on Amazon. It is made up of the information you enter when you list your product including its title, images, description, and price. Shoppers on Amazon use product listing pages to make a purchase, i.e. the Add to Cart button is on all product listing pages. As a result, getting the product listing right will determine the success of your products on Amazon. To achieve both objectives, it is important to optimize your product listings on Amazon. 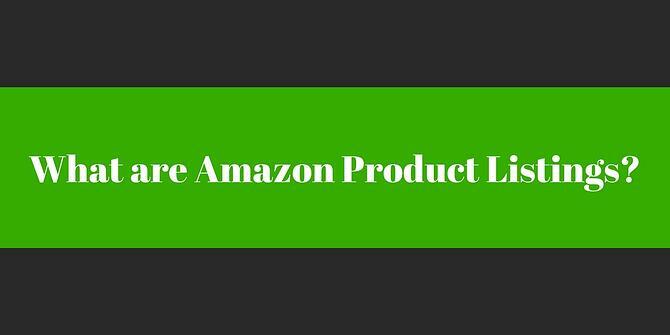 Product title – your product title in an Amazon product listing can be up to 500 characters (with some products you get 250 characters), so there is plenty of space to go into detail. In fact, many product titles on Amazon are more like mini descriptions of the product. In most cases, the more information you give, the better. You should include the main keyword for the product as close to the start of the title as possible. You should also include all the main elements such as brand, product name, model number, color, size, type, etc. Images – an Amazon product listing should have at least five images of the product. There should be a variety of images too, including images showing the product's size and the product being used. Showing multiple angles of the product and its packaging is also helpful. In addition, it is important to follow Amazon's requirements for images. Bullet points – below the price, product options, and shipping details of an Amazon product listing’s page are several bullet points. The best way to use this section is to highlight the product's main features and benefits. You should do this while using as many secondary keywords as possible. Remember, this part of the listing is more important than the full product description because of the position it appears on the page, i.e. above the fold and close to the images, price, and Add to Cart button. Description - even though a description is not as important as bullet points, it is still important. It lets you give more information about the product and include your keywords again. When writing your product description, think about your customer. What is the information they would most want to know? This is the information you should include. Product reviews and ratings are other essential elements of a product listing, although they are elements that you do not have as much control over. You shouldn't ignore them, however, as they influence buying decisions. In other words, if you get good product reviews and ratings, you should sell more on Amazon. This process takes time and is mostly about delivering high-quality products and an excellent level of service. Some things you can do to help generate good reviews and ratings is to communicate with your customers about their order, regularly test your procedures to ensure they are up to standard, and read customer reviews, particularly the bad ones. The latter is tough, but bad reviews might highlight something you can improve to prevent a similar bad review happening in the future. You should never regard a product listing on Amazon as being complete. It is something you should continuously seek to improve and optimize. You should do this with product reviews and ratings, as already mentioned. You should also optimize other elements of your listing by split testing. This involves changing one element of your product listing and then measuring its performance compared to the original to see which performs best. In other words, a product listing is more than a way of getting your products onto the Amazon marketplace. Product listings are also a tool you can use to increase your sales.